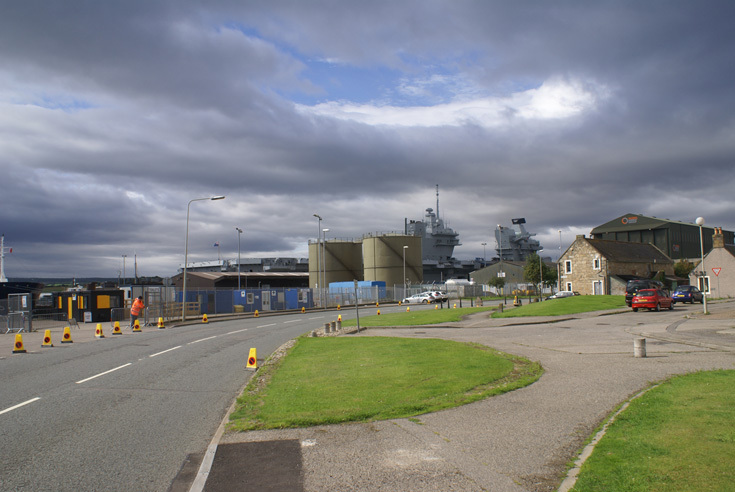 The new aircraft carrier HMS Queen Elizabeth has returned to Invergordon following her sea trials. This view shows the relative size of the ship, dwarfing the Service Base. The old Customs House can be seen on the right. It also shows (sadly) the mess around what used to be the shore-line..
Harry, be thankful you were around when the firth looked like the picture #827 taken from the war memorial. I can still remember how it looked like in those days. Hi Eddie, yes that is how I remember it too. But then there was no work for us, hopefully it is better now. Hi Harry, True, certainly that was one reason I ended up joining the Merchant Navy, eventually ending up in Houston Texas. Eddie, quite a few lads from Inver-g joined the merchant navy and some jumped ship elsewhere. Hi Harry, Thanks for asking. We're some of the lucky ones. Although we had to move out of our neighborhood because of a mandatory evacuation order, the water stayed within the levi system. A bit of a panic to start with as we were only given an hour or so to get out and we had to decide what to pack and what to try and jack up off the floor to try and keep things dry. Anyway all my family here is okay and dry. That's great Eddie, yes you were indeed lucky. As long as family is ok then that's the main thing..
Eddie, were you a member of the Police Gang? that used to man the wall behind the police station? Hi Harry, I sure was. There was a shed at the bottom of the garden close to the road that we used as a gang hut. Also we used one of the cells when no one was in residence. The other one was a store room. The Macphails were quite a bunch. Hi Harry.That was a kind of double edge sword. We had to make sure we didn't put a foot wrong as the long arm of the law was a bit too close and we got quite a few lectures on right or wrong. But good times anyway. Ah! Sgt McPhail! I always got confused between him and the copper in Oor Wullie. Mention of Sergeant McPhail brings back memories of life in Invergordon in the forties and fifties. Murdo McPhail came from the west coast and was Sergeant at Invergordon, then Inspector at Dingwall, if my memory serves me well and was then appointed to a post at the police training school at Tullieallan. He suffered an untimely death at a relatively young age. He was a very humane man, with a realistic approach to his duties, as far as the youth of the town was concerned. His corrections were delivered in a kindly and fatherly way and generally took the form of advice rather than reprimand. He took part in the life of the town in several ways, apart from his duties as custodian of law and order. He was a supporter of the Scout Troop and went to some of the annual camps and was an enthusiastic member of the Amateur Dramatic Society, appearing on stage at their annual performances. One incident in particular is etched permanently in my memory. The play, in three acts, if I recall correctly, was set in the days of the horse but unfortunately the costumes had not been delivered in time for the opening night, so makeshift attire had to be found. I remember Murdo struggling into a pair of breeches many sizes too small for him and the worry was that they would not survive the strain and the drama would be reduced to farce. To the relief of the cast, the stitching held, which in view of Murdo’s generous bulk, was a tribute to the tailor. Murdo was to arrive at the gallop on horseback, off-stage of course and make a dramatic entrance. I was assisting Hugh Ross back-stage, when Hugh suddenly remembered that he had not organised the horse-hoof sound effects. He thrust a couple of half coconut shells into my hands and told me to make the required sound-effect. I did my best but without stage directions had little idea of what effect was required. Murdo appeared on stage to the sound of the horse still galloping full tilt, suggesting that he had jumped off, or more likely fallen off the horse. That marked my one and only foray into amateur dramatics. Yes Gordon. Sgt McPhail took his responsibilities seriously and made great effort to "integrate" with the general populus, sadly the police today appear to prefer being "distant" from those they serve. I remember being ticked off regularly for no lights on my bike, but in a friendly and positive manner. This would never have happened to the Legges, who always had the latest tech on their bikes, I was jealous! !